This restaurant is located quite near the city hall, having been situated in Bennet's Hill from 2013 until moving here in January 2016. 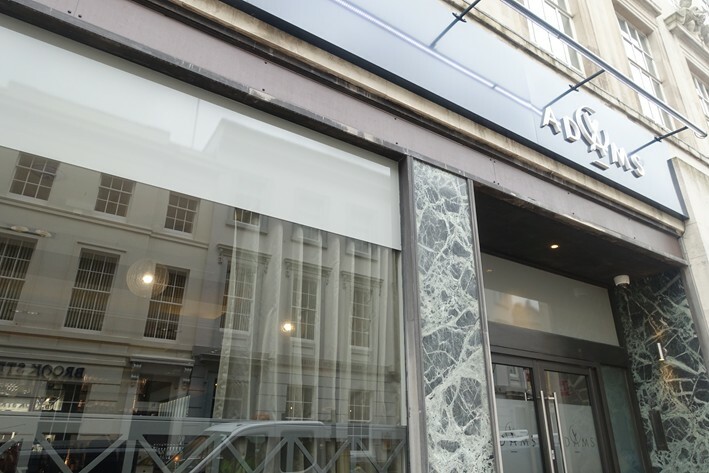 Adam Stokes runs the restaurant with his wife Natasha, the establishment spread over three floors and seating 36 diners at one time. Downstairs is the large kitchen and the chef's table. 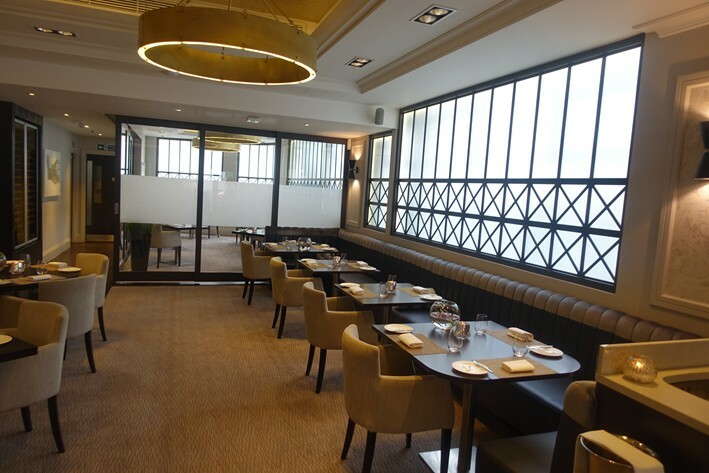 The decor is smart, with the carpeting ensuring sensible noise levels, the tables well spaced. 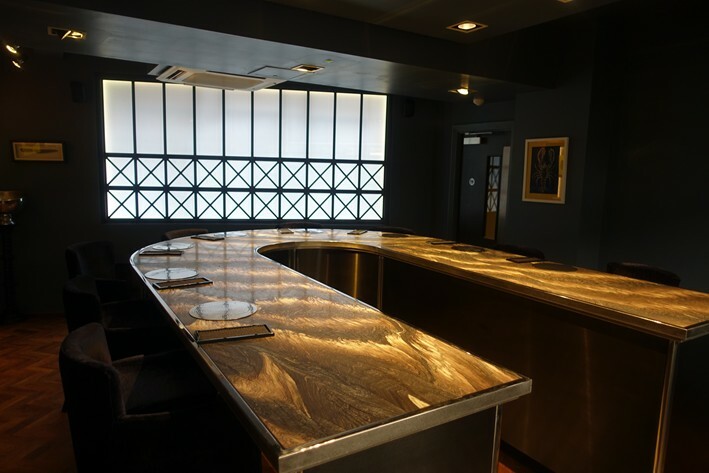 Adam's won a Michelin star in its first year of opening, which it has retained ever since. 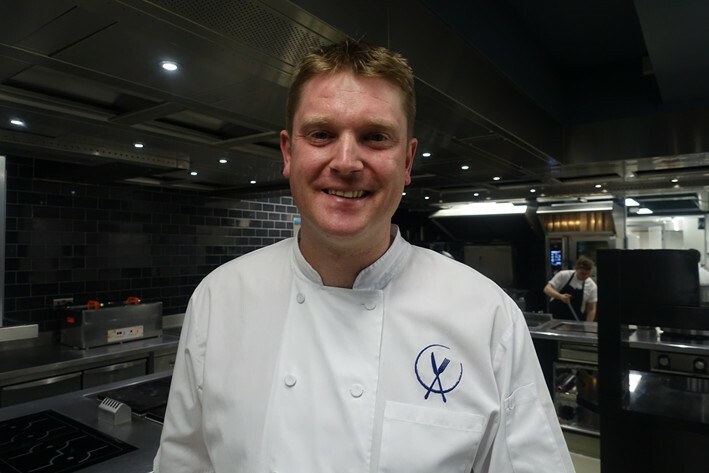 Adam previously spent seven years training at Hambleton Hall and was head chef at Glenapp Castle in Scotland, gaining a Michelin star in his four-year stint there. 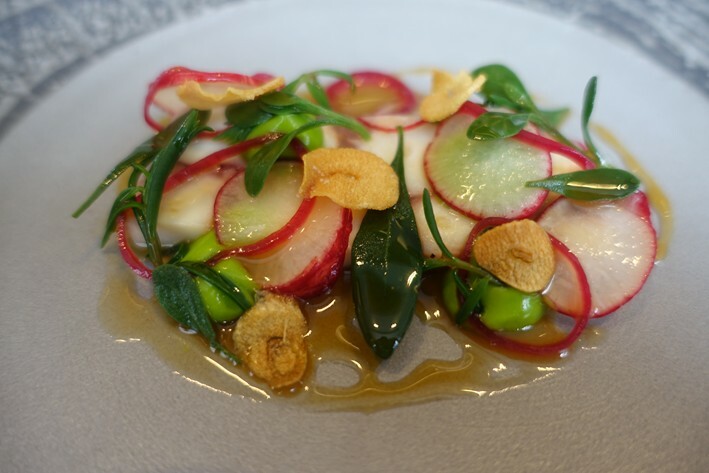 Three courses from the carte were priced at £60, and in addition there was a tasting menu at £90, and a three course set lunch choice at £37.50. The wine list ranged in price from £29 to £675, with somewhat variable markups. Example labels were JJ Prum Kabinett 2014 at £50 for a bottle that can be found for £18 in the high street, the excellent Jermann Vintage Tunina 2010 at £70 compared to its current retail price of £46, and Bressan Schioppettino 2011 at a chunky £93 for a bottle that will set you back £26 in a shop. There were also prestige labels such as Vega Sicilia Unico 1994 at a very reasonable £490 compared to its retail price of £457, while Mouton Rothschild 1999 was £675 for a wine whose current market value is £449. 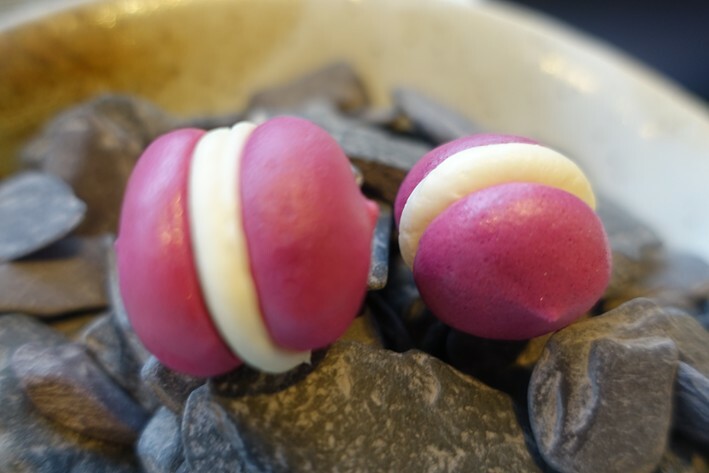 The first nibble was an impressive beetroot macaron with goat cheese mousse, the macaron extremely light, and the cheese and beetroot flavours coming through well (17/20). 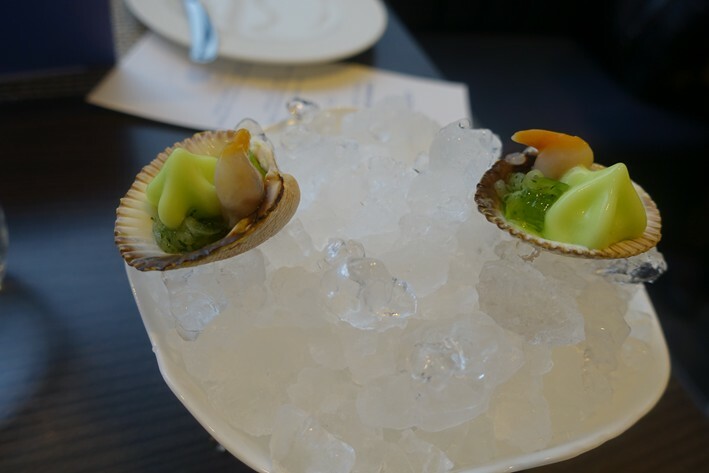 This was followed by cockles cooked in white wine and tomato and served on their shells. This was fine though there are limits to how exciting a cockle can get (15/20). Next was crab with sweet corn and grapefruit served on crisp chicken skin. 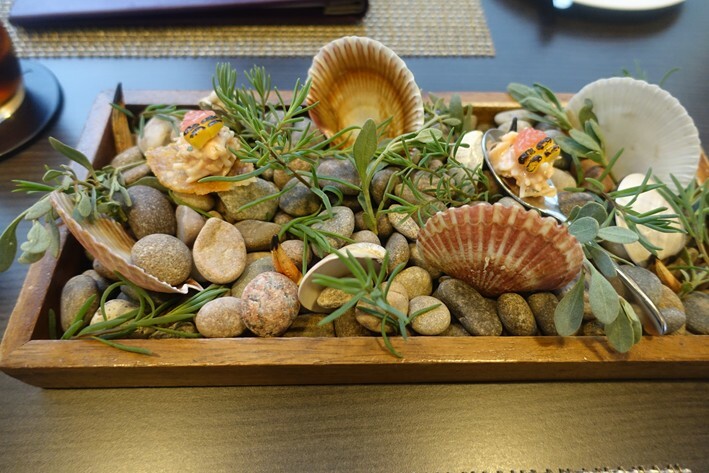 This was a remarkably effective combination of flavours, the acidity of the grapefruit nicely balancing the crab, the sweet corn adding its earthy flavour note and the crisp chicken skin providing a pleasing textural contrast (18/20). Parmesan ice cream with coffee powder featured very impressive ice cream with deep flavour, though I am not sure what the coffee powder really added (16/20). 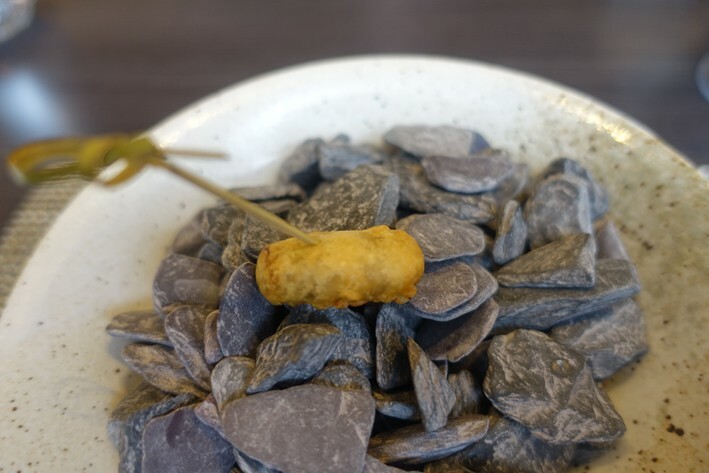 Button mushroom beignets had an excellent duxelle of mushrooms inside a crisp coating (16/20). I was very impressed with a further nibble of "liquid roast chicken". Here chicken wings had been slow cooked together with stock, vegetables and stuffing, then allowed to cool, set in agar, frozen and finally deep-fried, the final effect being a bit like a xiao long bao dumpling, the jelly liquefying when cooked inside its protective outer shell. Essentially this was all the components of a full chicken dinner concentrated into a delicious ball that melted as you bit into it - terrific (18/20). 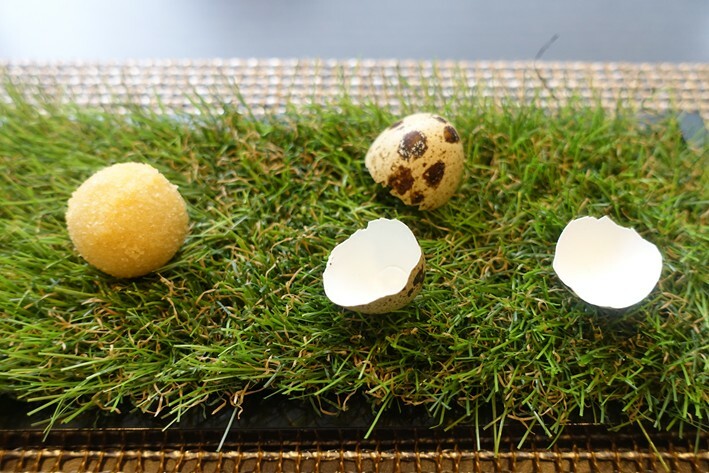 At this stage the tasting menu had not yet begun, and yet we had already sampled some very impressive food. Bread was a selection of three sourdough slices, a dark rye made in the kitchen and the others (white and multigrain) prepared by a bakery called Lucky Thirteen to the kitchen's specification (16/20). 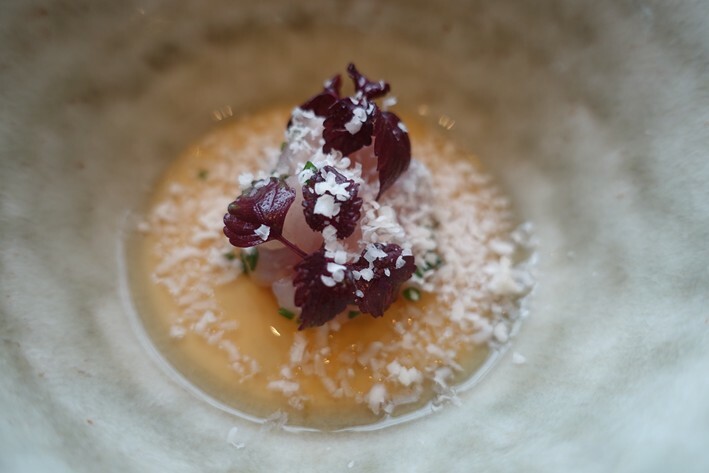 The first formal course of the meal was mackerel with Japanese umami custard, smoked lardo powder, shiso leaves and chives. This was an effective combination, the mackerel tasting fresh and combining well with the Asian flavours (16/20). 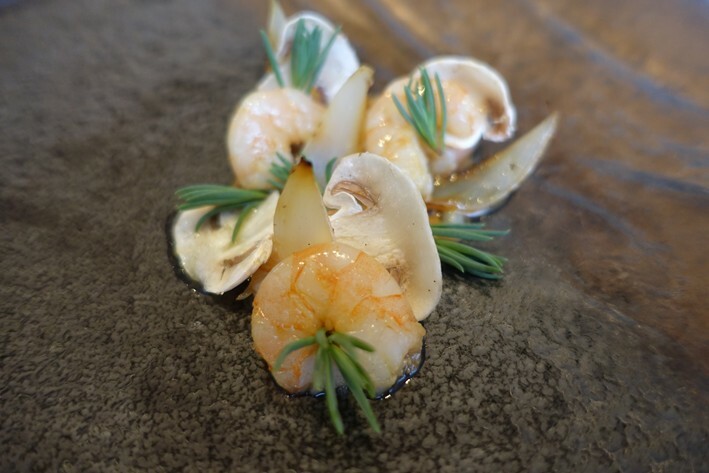 Prawns were carefully cooked, coming with charred onions that were nicely caramelised (16/20). 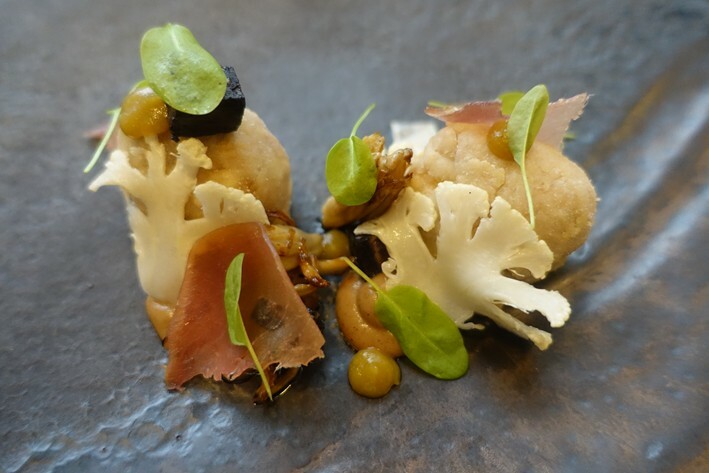 Veal sweetbreads were served with cauliflower and hen of the woods mushrooms. The mild, almost creamy flavour of the sweetbreads was nicely balanced by the earthiness of the cauliflower and mushrooms (16/20). Octopus came with avocado purée, chorizo, sea vegetables, radishes and garlic crisps. Octopus is not easy to prepare, and even in Japan I have occasionally ended up gnawing through a chewy one. Not here though. The flesh was tender, the avocado going well with it, the garlic crisps light and yet packed with flavour, the chorizo an excellent flavour combination (17/20). Hare came with red cabbage, a little Barkham Blue cheese, dark chocolate and a vinegar made from Canadian Ice Wine called "minus 8". This had all the potential to be a car crash dish, yet actually worked really effectively. The cheese was subtle enough to not dominate the dish, the hare itself was not overly gamey, the cabbage was an ideal foil for the rich hare, and the vinegar cut through the richness of the rest of the elements (17/20). 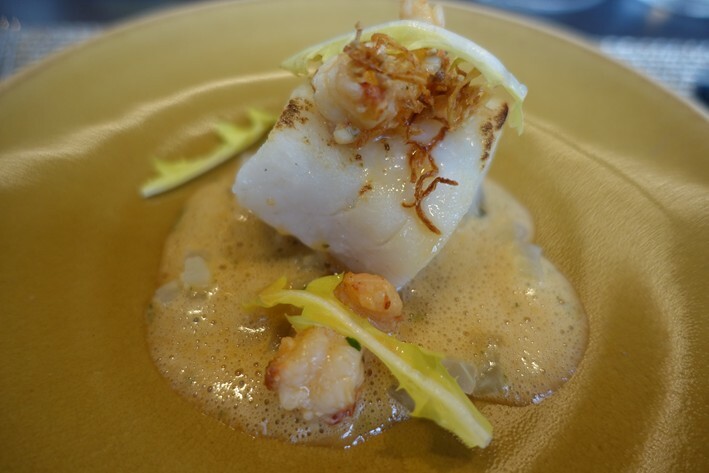 The pescatarian alternative was pollock with crayfish bisque, dandelion leaves and crisp ginger. This was fine though there are limits to what even the most capable chef can do with pollock (15/20). Diver caught Orkney scallops were served with cubes of celeriac and celeriac purée, apple, red gates and a croquette of pig trotter and eel. 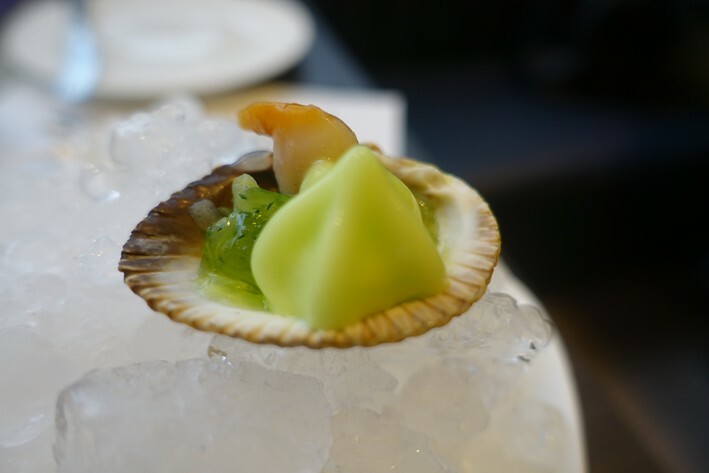 The flavour combination was classical and lovely, with the inherent sweetness of the scallops, the earthy celeriac and the sharpness of the apple. The croquette was packed full of flavour and I would have scored this higher except that the scallops were cooked just a fraction long. They were a long way from being chewy, but were just cooked a tiny bit longer than would be absolutely ideal (16/20). 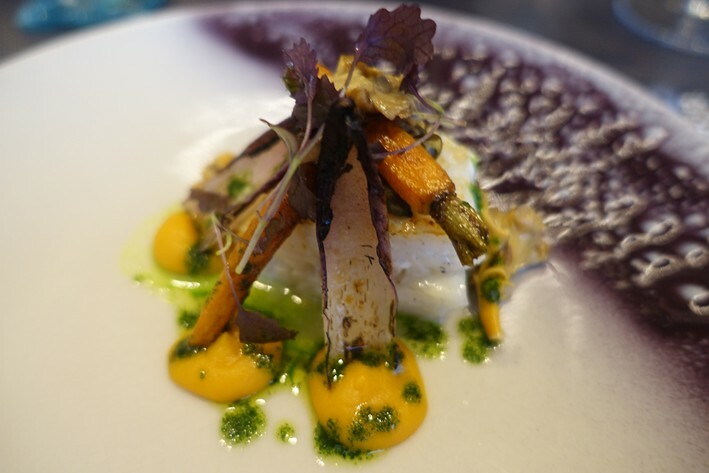 Brill came with butternut squash, cumin purée, chanterelles,, charred endives, salt baked baby carrots and sage oil. The fish was carefully cooked and the carrots were good, though I have eaten better chanterelles (16/20). 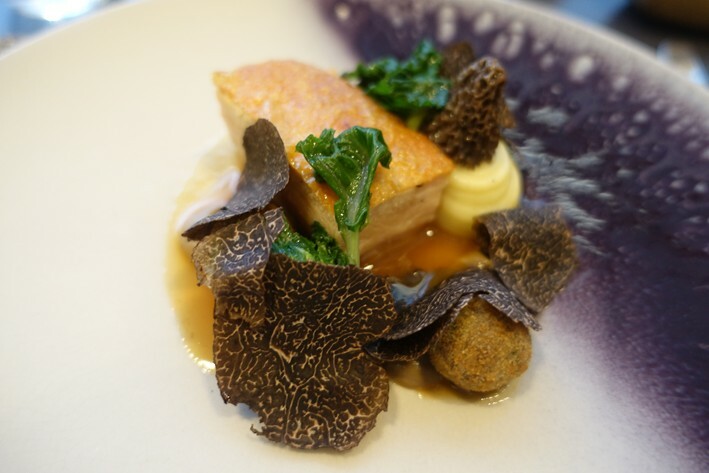 My main course was Goosenargh chicken with morels, croquettes of haggis, Perigord truffles, Madeira and mushroom purée and kalettes, which are a cross between kale and Brussels sprouts. 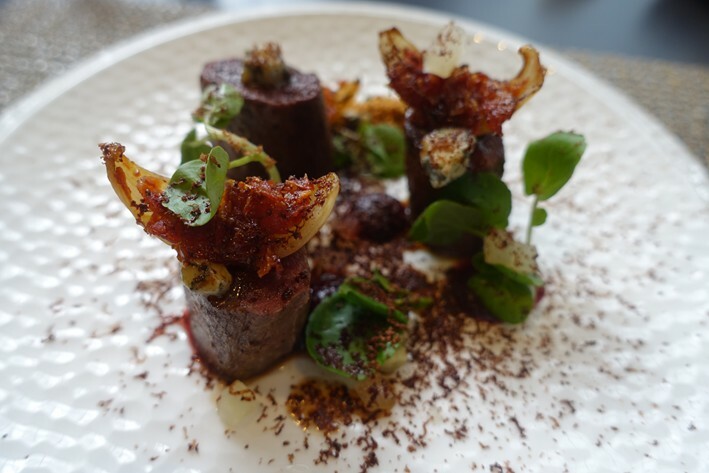 This was a superb dish, the morels excellent, the haggis croquettes full of flavour, the kalettes an interesting bit of greenery and above all the chicken tasting great (a rare phrase indeed in the UK) and beautifully cooked, the dish precisely seasoned (18/20). 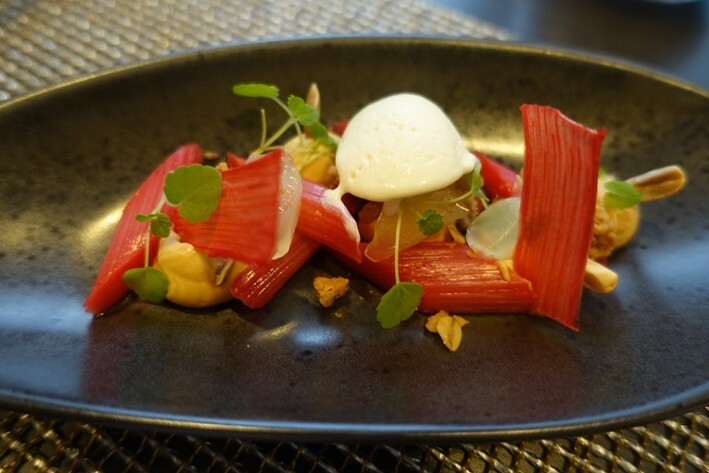 Rhubarb was poached and served with caramel mousse, chopped almond, oat granola, rhubarb crisps, creme fraiche and cardamom sorbet, ginger beer jelly, and a leaf that had flavour reminiscent of liquorice. The rhubarb was excellent, not too tart and cooked carefully, the oat granola providing a nice contrast in texture to the ice cream, the jelly bringing the hint of ginger, which goes so well with rhubarb (17/20). 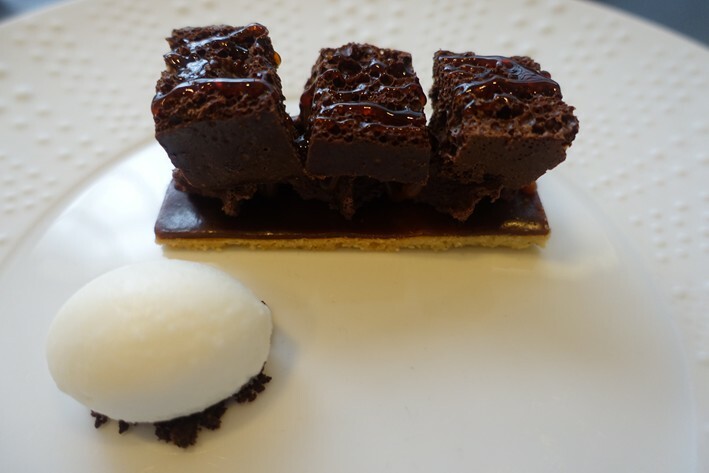 The final dessert was aerated chocolate with blood orange marmalade syrup, chocolate caramel and salted milk sorbet. This was enjoyable, though I would have preferred more sharpness from the blood orange to balance the richness. The sorbet worked well but a little more of it would have been welcome (16/20). Coffee was Nespresso (are there no artisan roasters in Birmingham?) 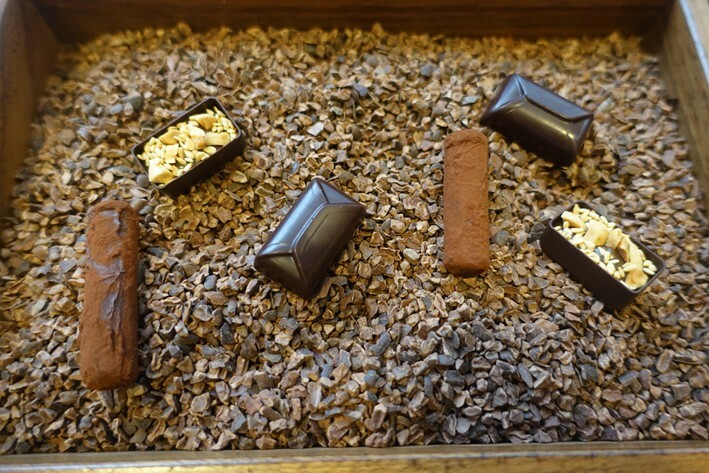 and came with a trio of petit fours: chocolate with peanuts, dark chocolate with black pepper, and an excellent ganache with lime. Service was genuinely top notch. When I asked our Slovakian waitress a question about a dish, she knew the cooking process inside out, and there were some little service touches that were very nice. 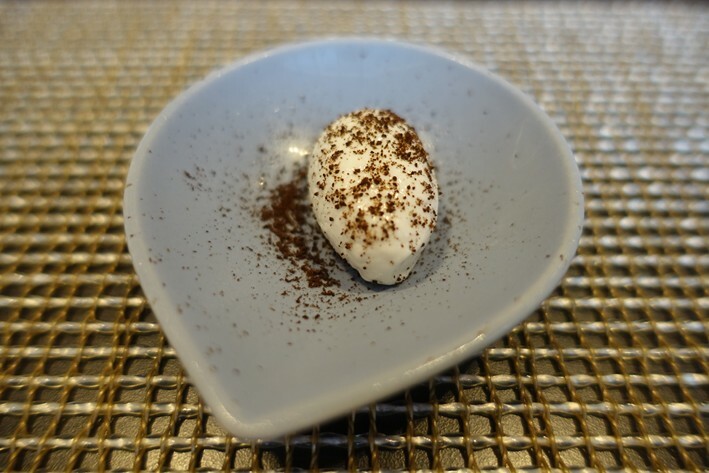 For example I had swapped a dish on the tasting menu for one on the carte, and when I asked to see menu again it to look something up it reappeared, printed out yet already having the dish change that I made shown on it: spooky. I have worse service in plenty of three Michelin star restaurants than this. The bill came to £127 a head with some glasses of wine. 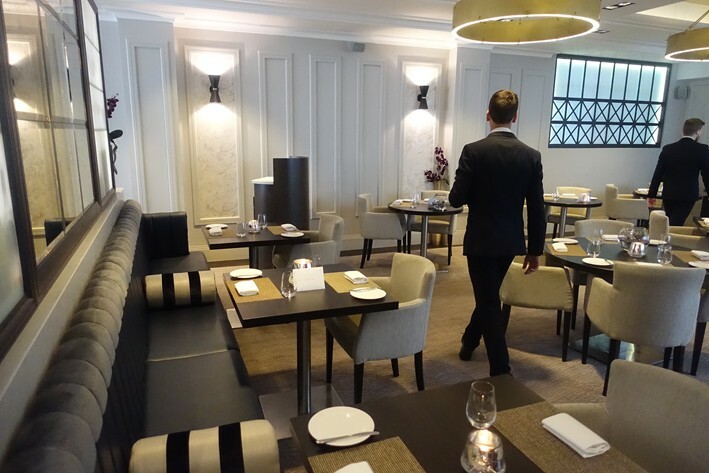 If you went a la carte and shared a modest bottle then a typical cost per head might be around £90, and of course there was also the cheap lunch option. Overall I was very impressed with the entire experience at Adams. 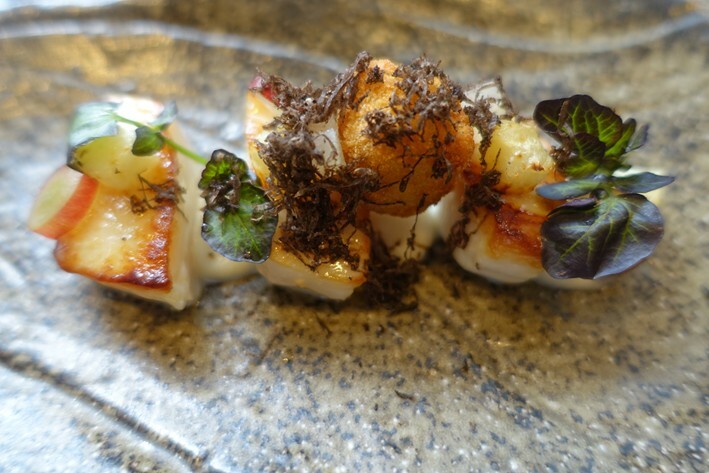 The décor is smart, the service was exceptional and the cooking was more two-star level than one as far as I am concerned, with some genuinely exciting dishes. I highly recommend it. One of my favourite places to eat in the UK. Stunning food and service.